Regular readers of GPS World are aware of many of the rapidly developing technologies and navigational systems being created around the world, but often the everyday surveyor shows up late to the party. While smartphones get the most mainstream media coverage, other navigational devices and measurement systems are adapting to evolving technical breakthroughs and new methods of transmitting a variety of data wirelessly. This month’s article looks at the increase in satellite navigation networks along with the rollout of 5G cellular technology. Both advancements will benefit the surveying community; to start, I’ll explain what this means for accuracy and precision of survey measurements as well as productivity. I’ve been known to wax poetic in this column about my admiration of GNSS technology, and I continue to marvel at the “accidental” civilian use of a military tool. This method of measurement and navigation continues to expand, refine and transcend everyday life, and surveying is no exception. The satellite constellation is the mainstay of this navigational system. The United States began the charge several decades ago, but other nations are quickly catching up. Let’s look at the current constellations and their status. There are now more satellites. What’s the big deal? The addition of these constellations provides large gains for the surveying community in several different ways. First, the additional satellites mean more signals to help with the mathematical equations necessary for positional determination. While traditional surveying in the general public’s eye is associated with measurements on the ground, our expansion of services into the air and water relies heavily on GNSS determined positions. No matter what type of remote sensing equipment is being used (lidar, photogrammetric, sonar, etc. ), positional determination for most of those sensors are derived from GNSS-based receivers. Add to these measuring methods the ability to perform operations via remote-controlled or autonomous vehicles in both air and water, and the availability of additional satellite signals enhances the reliability of GNSS-derived data and attributes. Second, by having more satellite signals to utilize, GNSS receiver manufacturers can improve the software for processing the positional information with greater certainty of accuracy. Before the introduction of additional constellations and receivers with expanded signal reception, GNSS users relied on less sophisticated software to identify potential “bad” signals that would lead to incorrect positions. While the software generally provided reasonable reliability, it was not foolproof and occasionally would allow bad data to be accepted. 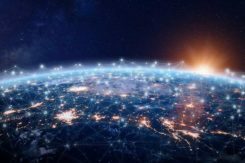 Like most everything tech-related, however, the GNSS industry has benefited from increased computing power to go along with the additional satellite constellations. The latest GNSS receivers can accept well over 500+ signals from a variety of sources (including land-based transmitters). The software used to reduce all that data has increased in complexity along with number of those data sets. 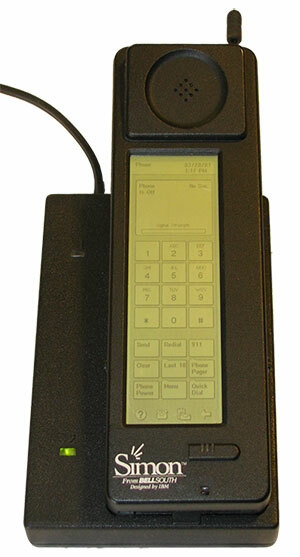 Complex computations that were once limited to mini-computers or even mainframes are now being completed on handheld data collectors in minuscule timeframes compared to their predecessors. The software has also been enhanced to analyze the data in real-time, compute the likely position of the receiver and notify the user of potential incorrect or “spoofed” data from any number of satellites. Considering that many of the remote-sensing sources now collect millions of points based upon one GNSS-based position, the need for increased positional verification has become a critical issue. By having many more constellations to provide signals for positional data, the percentage of establishing a correct location for each data point has increase significantly. The improved computing power and verification ability of today’s GNSS software is helping to eliminate errors in positional accuracy and instill more confidence in the surveyor’s data collection activities. 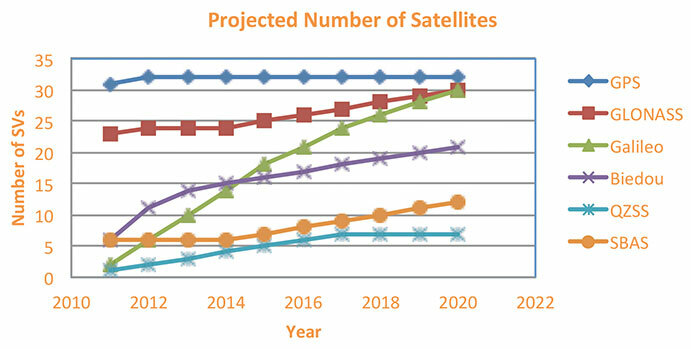 Add to these additional constellations the planned installation of more land-based signal providers to augment or provide a backup plan for satellite systems, and it’s clear that the future is quite bright for GNSS-based receivers and data collection for everyone — especially the surveying community. While surveyors marvel at the advancements of GNSS-based measurement, it pales in comparison to the rapid growth of modern technology with cellular devices. Notice I didn’t write cellular phones, as the technology has quickly established itself as much more than voice communication. Before we lay out the future of cellular data networks, let’s take a step back and see how this type of communication has revolutionized GNSS-derived data collection for surveyors and others. The technology behind wireless communication goes back several decades, but didn’t become a mainstream system until the late 1970s and early 1980s. Motorola is known as the early force behind the two-way radio system, but the base and remote transmitters were not cost effective for small businesses. This type of system was also limited to single-purpose radios with individual crystals wired within that only allowed specific frequencies to be transmitted. Another type of communication used by some was the citizens band radio, affectionately referred to as CB radio. This radio was limited to 40 channels and didn’t allow for private transmission between two parties. During the 1970s, the use of the CB radio was not limited to long-haul truck drivers — many people used the medium for basic communication. Telephone service during these times was still costly and long-distance calls were not cost-effective, so many found the CB radio as an alternative to conventional phone service. Looking back now, it is not a stretch to classify this type of broadcasting as a primitive social media precursor to today’s methods but limited to live chats and no visuals. Another method of transmission was short-wave radio. This system was like two-way radios with an established base transmitter, but broadcast on public frequencies over greater distances than CB radios. One of the big drawbacks was the upfront costs, which were much more significant than the other radios. Even more expensive was outfitting a vehicle with a shortwave system, so cost was the biggest limiting factor for this mode of communication. The popularity of telephone-based pagers didn’t hit its zenith until the early 1990s, but the technology and actual use dates to the early 1960s. 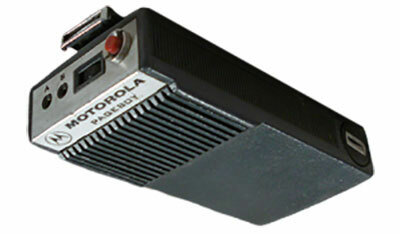 The first commercial pager was produced by Motorola in 1964 and called the Pageboy. There was no screen or display; the user was notified by a variety of tones preset for distinct situations or needs. As this technology advanced, variations in screens, message types and even two-way communication became possible. By 1994, there were more than 60 million pagers in use, but a change was in the technological wind; cellular phones were marching toward the mainstream. While the concept of wireless telephone communication existed in several laboratories around the world for years, the first big breakthrough was made by researcher Martin Cooper, who developed a prototype cellular device for Motorola in the early 1970s. He famously made the first public cellular phone call on April 3, 1973, to Joel Engel, head of research at Bell Labs, during a walk in New York City. Cooper and Engel were engaged in a rivalry to develop the first commercially available cellular phone with the Motorola DynaTAC prototype being the first to make a successful call. However, the rush to get cellular phones to market took longer than anticipated. 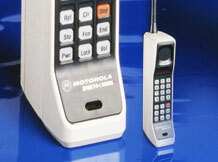 It wasn’t until the introduction of the Motorola DynaTAC 8000 in 1983 (available to the public in March 1984) that the reality of wireless phones came to life. The cost of wireless freedom came at a price: $3,500 for a brick-sized phone that took 10 hours to charge for 30 minutes of use. The cost of the service was also expensive due to the limited cellular infrastructure. The next decade brought us expanded cellular coverage along with miniaturization of phone; each subsequent model provided more features and longer battery life. From the Nokia “candy bar” to the Motorola Razr, the cellphone era had engulfed the mainstream, but more changes were ahead for mobile communications. The late 1990s saw the introduction of the cellphone as a computer modem, with limited email connectivity and primitive internet browsers built into the operating systems. But like many electronic technologies that came before, the cellphone would begin a radically different life in the mid-2000s. Officially, the smartphone has been in existence since 1992 with the creation of the Simon Personal Communicator from IBM. At a cost of $1,100, with a monochrome screen that was 4 ½ x 1 ½ inches, the Simon allowed the user access to email and faxes (remember those?) along with the phone function — but users had to make it fast; the battery only lasted an hour. IBM sold 50,000 of these units before pulling the plug on the project, but it started the trend toward mobile telephones with a graphical interface and extended uses beyond the standard verbal communications. Just like the Apple Newton was the failed precursor to the Palm Pilot, various tablets and eventually today’s smartphone platform, the Simon broke ground and established new directions for future communication. The early 2000s introduced us to the Blackberry personal digital assistant (PDA) and phones from Research in Motion (RIM), a small electronic communications company from Ontario, Canada. RIM started small with a two-way paging system that became popular in Europe and quickly morphed into cellular devices that worked on the DynaTAC network used by Motorola. By the mid 2000s, their devices became affectionately known as the “Crackberry” as users became addicted to the functions and capability of this communication tool. These devices were popular with business users as the security encryption was considered more effective than any of the other communication apparatuses of the day. By 2009, Blackberry had reached the zenith of the mobile device market (second only to the conventional mobile-phone platform dominated by Nokia) but began a rapid decline due to proliferation of the next big thing — the touchscreen smartphone. 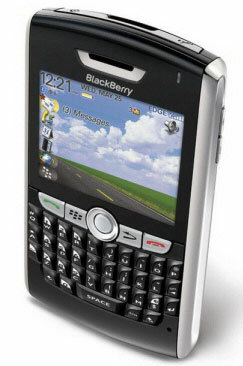 After Apple’s introduction of the iPhone in 2007, followed by a crowd of Android-powered phones in 2008 and beyond, Blackberry’s market share has been reduced to a small niche group. The rollout of Steve Job’s dream of combining Apple’s industry-defining iPod with mobile phone capability revolutionized not only the way we communicate — it has redefined our everyday environment. Many of the tasks we accomplish every day have been incorporated into a smartphone application, which brings us back to the reason this article is directed at surveyors: the device that hangs on your belt or rests in your pocket is revolutionizing the way today’s surveyors work. Not that long ago, the only navigational devices available were large, expensive and difficult to use. Now, nearly everyone owns a device with GNSS capability. When we combine the ever-expanding number of devices along with the increased coverage of GNSS satellite constellations, the ability to georeference any piece of data to greater precision and accuracy is improving. Surveyors need to embrace this technology within their smartphones to increase their efficiencies. At the same time, we need to help educate the public on why having better smartphone location capability doesn’t mean the masses can perform their own boundary analyses. For more information on this subject, see the GPS World July 2017 article. Surveyors should embrace the smartphone as an important tool; the introduction of new survey-grade GNSS receivers that use an app for the user interface will soon become commonplace. Several GNSS manufacturers have introduced receivers that exclusively use a smartphone and app for data collection, eliminating the need for a dedicated (and usually proprietary) data collector for obtaining centimeter-level location data. I’m not advocating that the surveying community throw their existing systems in the trash in favor of these newer receivers, but the data-collection techniques utilized by smartphones can increase efficiency and reduce equipment costs. Another reason to pay attention to the smartphone as a location tool will be the expanded use of dual-frequency chipsets to provide even higher accuracies. One of the fastest growing phone makers worldwide is Xiaomi, based in Beijing, China, which introduced the Mi 8 phone with a dual-frequency GNSS chip. This chip frequency reception (E1/L1+E5/L5) is targeted to embrace the Galileo and GPS constellations for increased accuracies (within a decimeter), well beyond the current norm for smartphones (typically 1-3 meters, plus or minus). For the surveyor, having this capability in their pocket can greatly increase efficiencies, especially when used during reconnaissance efforts. I believe many more phone manufacturers will begin to incorporate dual-frequency chips in their future models to increase location accuracies for users and take advantage of upcoming network enhancements. Speaking of network enhancements, let’s talk 5G as a gamechanger. The latest buzz in the general population’s lexicon is 5G and how it will push high-speed internet to all corners of the world. While this is a possibility, it means much more to the surveyor than meets the eye. Yes, there will be increased cellular coverage in places that previously lacked it, or only had limited access, but 5G means much more than that. Image: NTT DOCOMO Inc. 5G white paper. Let’s refresh our view of what cellphone coverage currently means to the surveyor. The use of cellular-based RTK receivers has been greatly expanded due to the increased coverage of 4G LTE signals throughout the world, but it’s still scarce is some parts. This is mostly due to the transmission of cellular signals being required from towers and higher placed antennas with powerful transmitters. These transmitters are costly and typically owned and installed by the larger telecom companies, so placement is traditionally in more populated areas. Enter 5G — while it will provide enhancements for all users, it will be revolutionary for the surveyor. 4G cell coverage was a broad and powerful signal from large transmitters; 5G cellular service consists of smaller cell signals placed in a tight grid of broadcast positions. These transmitters will be more cost effective for many telecom providers and will increase data reception for many users. For surveyors, the additional coverage of 5G will make possible the use of cellular-based RTK GNSS data collection in places not previously possible. Besides the extended coverage of 5G, the 10-fold speed of the new data transmission protocol compared old 4G LTE creates many possibilities for information collection growth. Soon it will be possible for a field personnel and the office staff to be linked in real time during the data collection process. From boundary-point recovery to complex topographic surveys, a field crew’s work can be supervised and reviewed while being completed, allowing for instantaneous analysis and guidance from senior staff. This process will allow for more oversight, quality control and mentoring of field staff than is possible for today’s remote crew operations. The new technology will also allow for reduced timeframes when crews are required to provide field data for tight deadline requests and gives us a method of instant feedback on the amount and quality of the data collection. Some may see this improvement in connectivity as an avenue for office staff to be intrusive on their field activities, but I see this as an opportunity for improved quality control and increased team interaction. More connected teams can lead to improved efficiencies and overall increases in productivity, profitability and morale among team members. Another breakthrough created by 5G will be the enhancement of indoor georeferenced location services. By having several transmitters placed throughout a facility, trilateration will be possible to provide more accurate location information for places not typically available to surveyors. Depending on the accuracy needed and placement of the cell providers, it will possible for surveyors to use devices designed for remote sensing (laser scanners, lidar, SLAM, etc.) and collect georeferenced data with greater accuracy in relation to a known coordinate system. This by-product will also aid rescue and medical providers during emergencies to help pinpoint individuals through their cellphone connection more accurately than before. 5G is more than just bringing YouTube videos to your phone faster; it will improve the data collection process of all shapes and sizes. Surveyors will not get left out, but we will need to be ready to take advantage when it comes online. For more on the 5G revolution, see the GPS World February 2018 article on this topic. As surveyors, just when we think that technology can’t take us further, we blink and change happens. Moore’s law stated (depending on which revision) that technology would double the number of transistors every one to two years. While some may say that technology is making Moore’s law obsolete, I believe the creativity being used to invent new processes based upon the technology is holding strong. I, for one, look forward to many more enhancements to follow in the coming years. 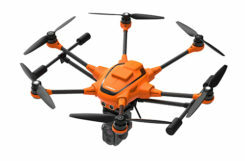 Surveyors be ready; the future is here. Tim Burch, GPS World’s co-contributing editor for survey, is director of Surveying at SPACECO Inc. in Rosemont, Illinois. He has been working as a professional land surveyor since 1985, and is the secretary, Board of Directors, National Society of Professional Surveyors.